Milkshake Kids | Good Finds That Give Back | Moms & Dads: Win a $750 Shopping Spree at Ethical Ocean! Ready to add a little extra jingle to your season? The holiday season is a time to come together, right? That's exactly why we've teamed up with our friends at Alignyo and Ethical Ocean to bring you a special contest. 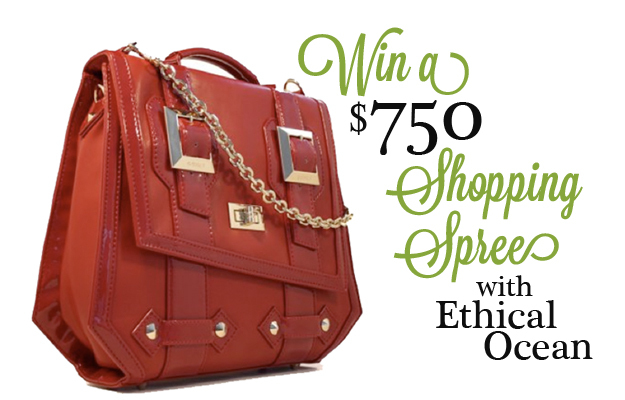 Just sign up here to enter a chance at a $750 shopping spree with Ethical Ocean. Simple as that! They've got a vast collection of everything from all-natural cosmetics to handbags made from recycled inner tubes. There, you'll find all kinds of unique gifts that give back -- we thought we'd guide you on a whirl through their sea of goods just in time for the holidays. Ethical Ocean presents a thoroughly-screened, thoughtfully-curated collection of the most ethical products in North America. All embody at least one of three designations: Good for People, Good for Animals or Good for the Environment. Alignyo is a community that celebrates yoga. Whether you’re a not-so-bendy newbie or a sinewy warrior, it rolls out all the recommendations, information and inspiration you need to stay centered and in the know. It's easy as pie to enter our contest. Just click on any of the contest banners on this page, then sign up and you're good to go!